If you are wondering about how many grams in a cup you have come to the right site. A cup can have a volume between 227 and 284 milliliters (ml), depending on how it is calibrated. 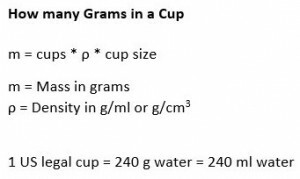 In addition, how many grams in a cup depends on the substance for which you want to change from volume to mass. Using the equation m = V * ρ when can convert any volume (v) to the mass (m) in grams. The density ρ (rho) is different for all materials, and subject to change with temperature and pressure conditions. Therefore, we must know the exact cup size and the substance’s value for ρ. As explained in detail in our article cups to grams, water measured in g/ml has a density of 1 if the temperature is 4 °C or 39.2 °F and if the pressure is that of sea level. m = cups * ρ * cup size; ρ in g/ml or g/cm3. If you don’t know the density choose the product from the drop-down options. The values for these substances are approximations. This brings us to the end about how many grams are in a cup. If you want to know about the inverse of how many grams in a cup you can find all information on grams to cups, including the converters. The information provided here are meant as a summary of the referenced pages which contains further information. If our article has been useful to you then bookmark us and give us a like. We also appreciate any comment or suggestions you might have.